Spread joy throughout the holidays with plantable ornament greetings! 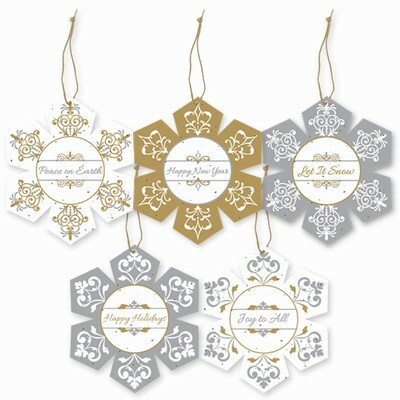 These decorative snowflakes can be utilized as greeting cards, gift tags or the entire set of 5 can be given as a gift. Fun and eco-friendly, these Grow-a-Note® seed embedded ornaments are made in the U.S.A. with 100% post-consumer pulp and embedded with a wildflower seeds. The growing instructions are printed on the back and there is room to write a custom message. Each set of the 5 elegantly designed plantable snowflake ornaments celebrates a different holiday sentiment and includes envelopes. After the holidays, they will keep on giving into the New Year. Simply plant the ornament in the ground, water generously and watch as the snowflake melts away and transforms itself into a colorful array of wildflowers!